Although my business is based out of Tucson, I am open to photographing weddings all over the state. 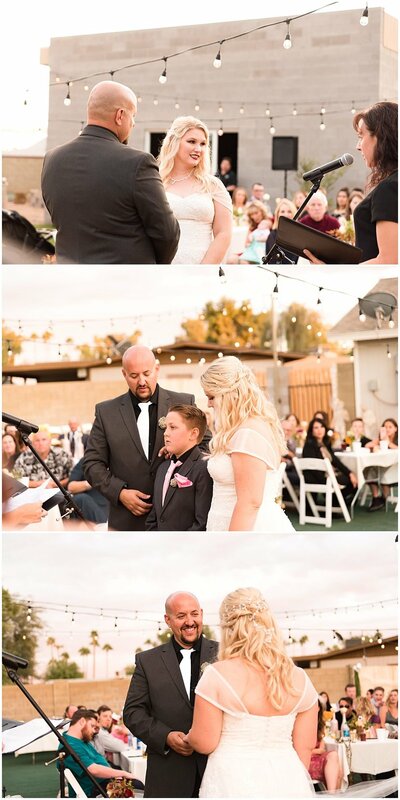 Ashley and Terry had a beautiful backyard wedding in Phoenix, Arizona. When Ashley and I first spoke on the phone, she expressed some concern that the backyard wouldn't come together as she hoped it would; however, the backyard looked absolutely beautiful with maroon and pink details, refectory tables, and white table clothes. She even had the most fun DIY photobooth. Morgan Aderson from The Flori.Culture created beautiful floral arrangements and bouquets. I especially adored the flower girl headpiece. Andrew's BBQ fed the hungry guests. I enjoyed their penne pasta and meatballs. The cake, made by Honeymoon Sweets, fit the style of this wedding perfectly. Ashley looked gorgeous in her David's Bridal dress. Ashley's day began at a nearby hotel where her and her bridesmaids got ready. The makeup artist and hair stylist were so professional, at times even working with each other WHILE working on the bride! Anything goes on wedding day, right?! Terry got ready at the house, while he and several members of his family finished up some ceremony details. They did an amazing job adding pink flowers to the ceremony backdrop. Their ceremony was short and sweet and full of love. It was amazing watching Ashley and Terry's son say "I do" to them officially becoming a family. After the ceremony, the party began. Their guests were so fun and danced the night away! Congrats Ashley and Terry! Thank you for including me in your day!